Frost Manor team members are seen here showing off their costumes during the Lindsay long-term care home’s Halloween party and costume contest. The Frost Manor team took this year’s Halloween party up a notch when the Lindsay long-term care home hosted a resident and staff costume contest. “The residents had a blast watching the staff parade their costumes around,” life enrichment co-ordinator Lyndsay Burton tells The OMNIway. Resident Sharon Arsenault won best-dressed resident for her “goofy clown” costume. Registered practical nurse Vikki Farthing placed first in the costume contest for day-shift team members with her fisherman outfit. Life enrichment aide Kim Williams placed first in the contest for evening staff members with her “dark fairy” costume. Lyndsay says her favourite part of the contest was watching residents’ reactions as each staff member arrived for their shifts dressed up in a costume. 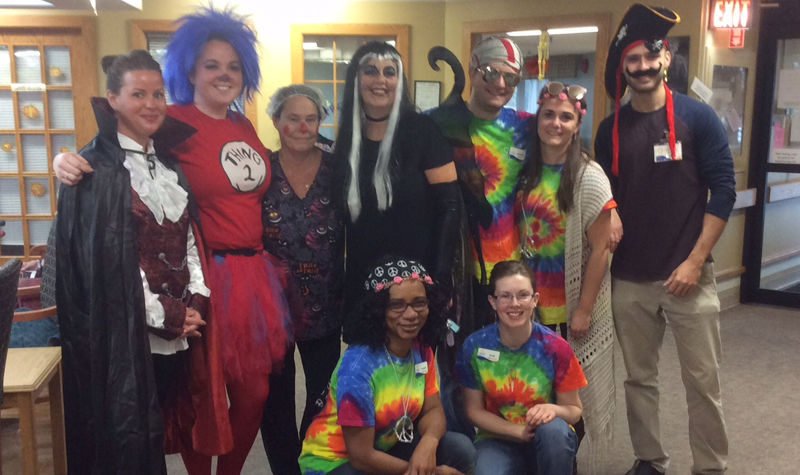 The day ended with a Halloween party with residents, staff and family members joining in on the fun. “Halloween is time when we at Frost Manor like to share our inner childlike spirit with our OMNI family,” says Frost Manor administrator and director of care Doneath Stewart. And such events are also beneficial to team members, Doneath adds.